Edouard Manet was an artist who bridged the gap between Realism and Impressionism. During his time Manet considered himself to be a Realist artist and he classed his work as sincere. However, his radical painting style and modern subject matter highly influenced the work of the Impressionists, which has led to him being perceived as the father of Impressionism. 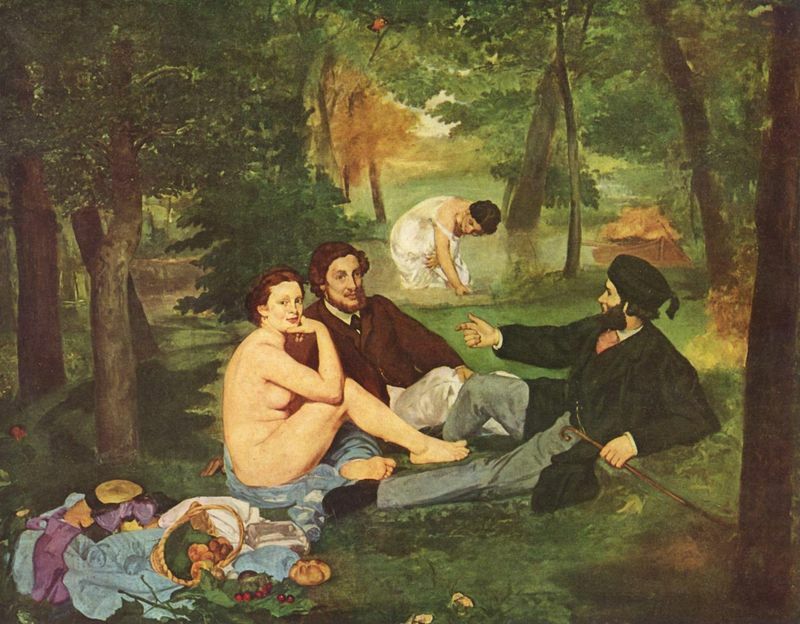 Manet's private life was controversial. He married his family's piano teacher, who had also been his father's mistress and had her own child. It is unknown whether Manet was the father or brother of the child; however he treated the boy as his own. Manet also maintained a close friendship with the artist Berthe Morisot, which is how he became acquainted with many of the Impressionist artists. Edouard Manet was born into a wealthy family on the 23 January 1832, in Paris, France. His father was a civil servant who wanted Manet to enter into the French navy. 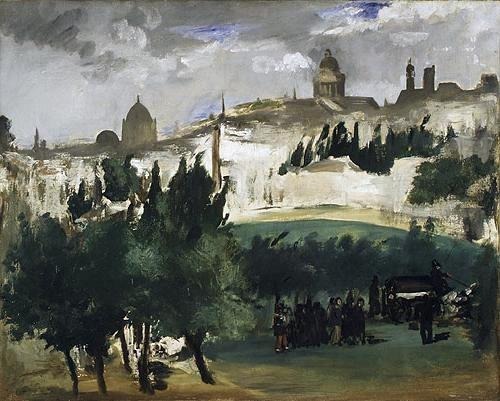 However, after twice visiting Rio de Janeiro, Brazil, on training missions and failing the course, Manet's father accepted that the navy was not the right career for his son. 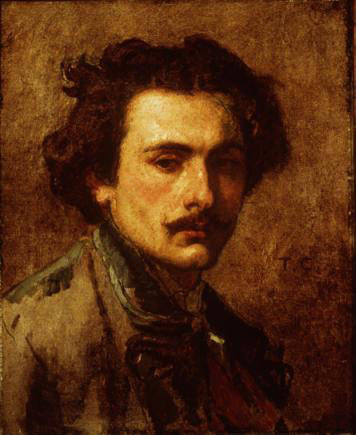 Consequently Manet entered into the atelier of Thomas Couture alongside his good friend Antonio Proust. Manet worked in Couture's studio until 1856 when he opened his own. Manet then went on to reject the teachings of Couture and worked in his own style. Manet did not like to layer his paints and preferred to work from subject matter that was directly in front of him and it was this painting style that went onto influence the Impressionist artists' work. By 1860 Manet was living with his mistress, Suzanne Leenhoff, who had previously had a relationship with Manet's father. In the early 1860s Manet submitted a number of paintings, such as Olympia and The Luncheon on the Grass to the Salon jury. These were unfortunately rejected and the artist was left despondent, due to his belief that an artist had to have their work accepted into the Salon in order to be deemed successful. In 1868 Manet was introduced to the artist Berthe Morisot and the two quickly became firm friends. Through Morisot, Manet was introduced to the other Impressionists, who he was soon considered to be a leader of although he never joined their art shows. With the Prussian war approaching Manet joined the army and evacuated his family from the city. During this period his art production came to a standstill. Manet became ill in 1879 and eventually passed away in 1883. Edouard Manet quickly abandoned many of the teachings of Thomas Couture and began painting in his own style. Unlike Couture Manet did not build up his paint colors into a thick glaze, but rather intended each piece of paint he applied to the canvas to be seen by the public (known as the alla prima style). Nevertheless, he maintained some of the same style and technique that Couture had used, such as using thick lines and dark colors. The alla prima style was quickly embraced by the younger generation, who later became the Impressionists. The alla prima style meant that a painting did not have to take months to create and allowed artists to paint from difficult to reach view points. This was advantageous for Manet because he preferred to paint from reality rather than his imagination. Manet was highly influenced by the growth of photography, and his close friendship with the photographer Nadar. 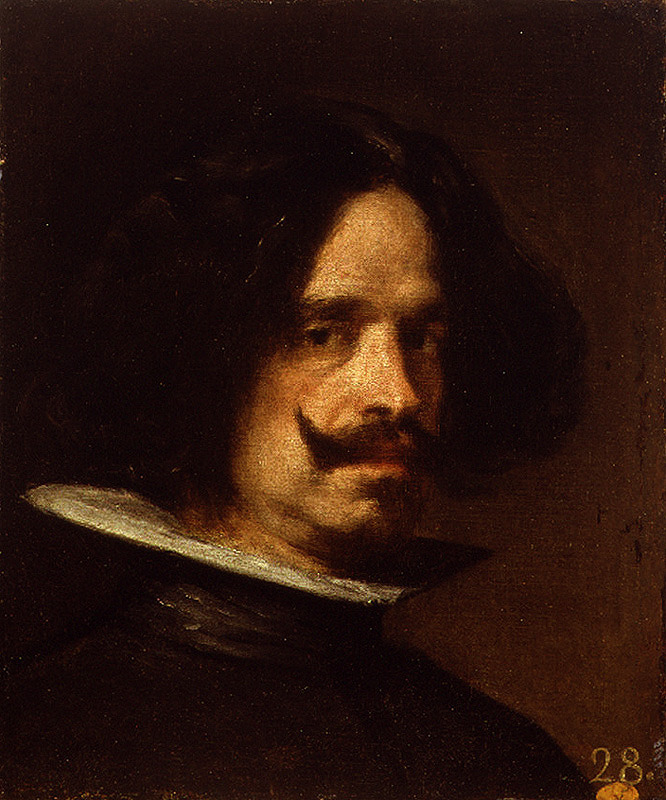 It meant that in many of his portraits the expression of his sitter is recorded exactly as he saw it. Additionally, Manet utilized many different colors to represent one tone, and one actuality. Rather than working with color scales Manet preferred strongly contrasting tones that appear to be one-dimensional. Thus, although the flat tone of his paintings appear simple, they were difficult to produce, especially considering Manet's aversion to layering paints. Alongside painting Manet enjoyed drawing and print making. 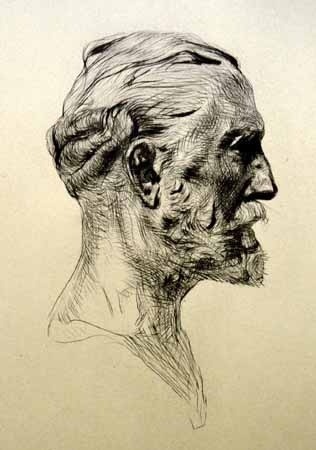 Although not many of his drawings still exist, those that do are certainly impressive. Again, he worked from reality and like in his paintings, the lines in his drawings are firm and strong. Manet was partly responsible for the revival of print making. Many of his prints were copies of his paintings and Manet believed in 'pure' etchings. Manet's goal was to produce paintings that accurately reveal to the viewer his reality. As a young man Manet's father had wanted him to enter into the navy. 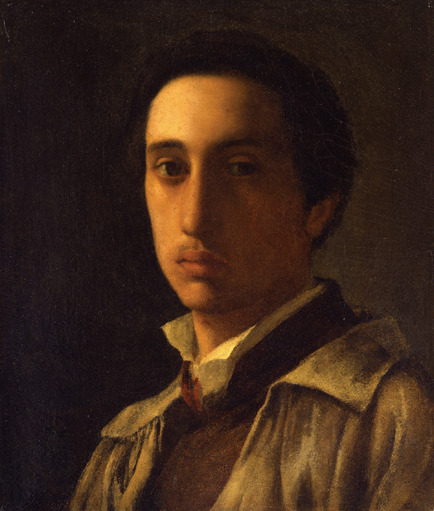 However, his uncle on his mother's side, Edouard Fournier, had encouraged him to engage his artistic talent and consider working as a painter. Consequently, after two failed attempts to enter into the navy, it was his uncle Fournier and his schoolboy friend Antonin Proust who encouraged Manet to study art. Manet first began his art studies in the atelier of Thomas Couture, who was highly innovative during his time and had set up his atelier in competition with the main Parisian art school. Like Couture, Manet was painting in his individual style and using his own techniques. Manet's art had a dark tone that was influenced by the works of the Spanish artist Velazquez, as well as Rubens and other Renaissance painters. Yet, many critics were disapproving of his work because they believed he was mocking the great Renaissance artists work with his model's poses. 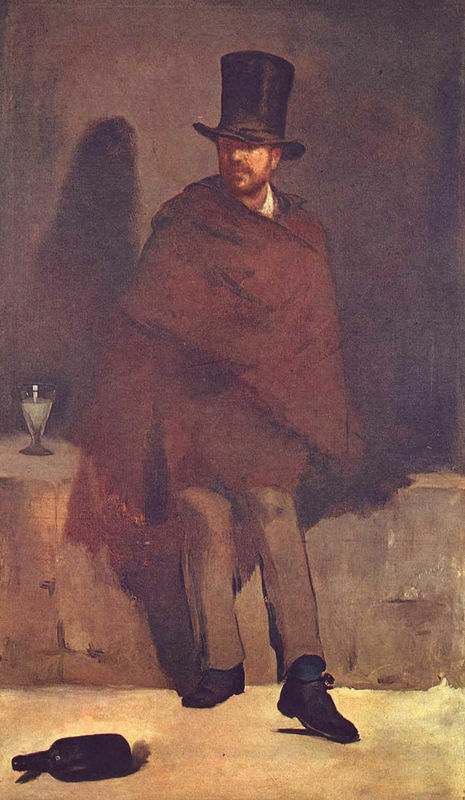 In the mid 1860s Manet traveled to Spain to see the works of Velazquez and other artists that he highly admired. Upon returning to France Manet came into contact with Berthe Morisot, who had a large influence upon the artist. Not only did Morisot encourage Manet to widen his color palette, she also introduced him to the other Impressionists. 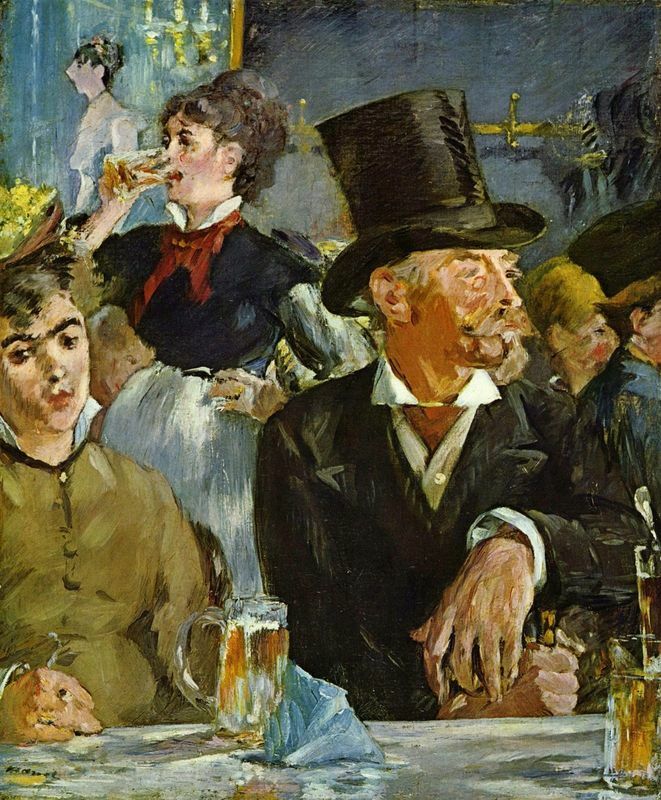 The vast majority of Manet's paintings depict scenes from daily life, observed on the streets of Paris. His café scenes serve as fascinating windows into the actuality of Parisian social life at the end of the nineteenth century, showing common people waiting, reading, listening to music, drinking, or talking amongst themselves. His paintings were often based on hastily executed sketches of scenes he stumbled upon on the street. Although spurned by the critics, Manet's supporters in the art world were numerous and ardent, including writer Émile Zola, poet Stéphane Mallarmé and poet Charles Baudelaire, who was Manet's inspiration to depict the actuality of modern life. Manet immortalized all of these writers with drawn or painted portraits. Manet had various followers and is considered by many to be the father of Impressionism. His influence on this group of artists was great, although he chose never to exhibit his work alongside them. 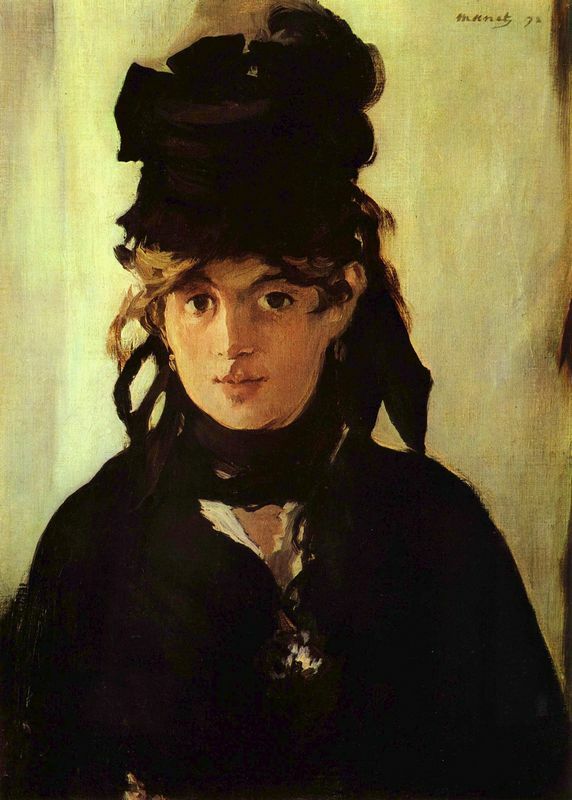 Nevertheless there were two women who Manet had a large influence on in particular; Berthe Morisot and Eva Gonzalez. All three worked closely and shared similar styles. Manet and the Impressionist Berthe Morisot became good friends in 1868. Manet was drawn toward the young beauty Morisot and asked if he could paint her portrait. After this Manet went on to complete many paintings of Morisot and even worked on one of her paintings for the Salon, to the young artist's dismay. Nevertheless Manet was never Morisot's official teacher. 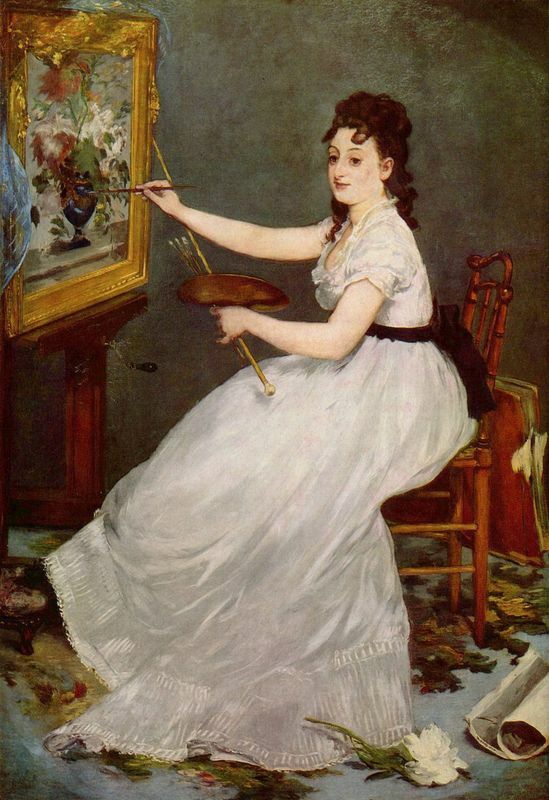 Manet only had one official art student, Eva Gonzalez, whom he taught in 1869. Neither the artist Manet nor his young student Gonzalez, exhibited with the Impressionist painters. However Gonzalez painted in an Impressionist style to a larger extent than even Manet. Between 1869 and 1872 she worked closely with Manet and her paintings were highly influenced by his style. However, after 1872 she began to develop her own methods and technique and was considered by many to have become even more 'Impressionist'. Alongside his followers Morisot and Gonzalez Manet is considered to have had a far reaching influence on the other young Impressionists, such as Edgar Degas. The group would meet at Café Guerbois and discuss their different artistic style and technique. The young Impressionist's were clearly influenced by Manet's alla prima style, dedication to painting only from reality, and simplistic tones. As a young artist Manet quickly began to work in a different style to many of his friends and broke from the rules that he had been taught in the atelier of Thomas Couture. As a result he received a great deal of harsh criticism and was mocked by both the general public and art critics of his time. Today Manet is considered by many to have been the father of Impressionism. During his lifetime Manet received mixed critical reception from the general public and art critics in Paris, France. In 1859 his first entry to the Salon was rejected due to wide criticism. However, by 1861 Manet's future was beginning to look brighter when two of his works were accepted by the Salon. The writer Emile Zola was a great admirer of Manet's painting technique and wrote many glowing reviews of his work. Manet's The Luncheon on the Grass and Olympia were next to be received with mocking sarcasm and the artist's hopes for a long career in the artistic world were dashed. 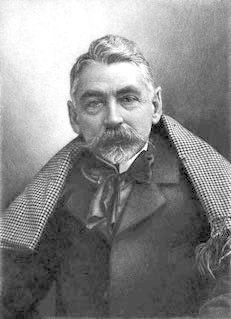 However, in 1876 Mallarme wrote a piece that first linked Manet to the Impressionists, which put his work at the forefront of the art world. After Manet died the respect for him as an artist increase. 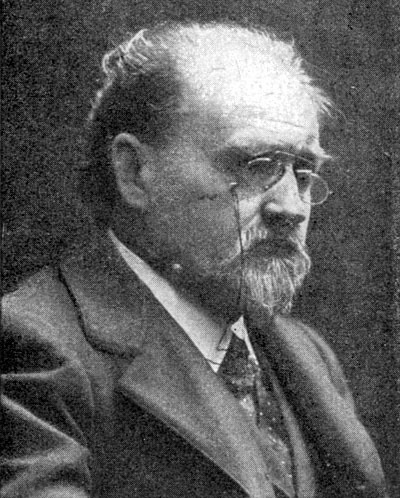 The writer Emile Zola wrote the introduction for his memorial collection and a number of his close acquaintances wrote his biography, which further increased his fame. For example his lifelong friend Antonin Proust wrote an invaluable account of Manet's life as an artist. Additionally, with the growing respect for the Impressionist artists Manet's work became more interesting to art critics. It represents the vital bridge between the Realist and Impressionist movements. In the 1920s many critics were considering Manet's work to be 'pure painting', fitting in with the Realist ideology. 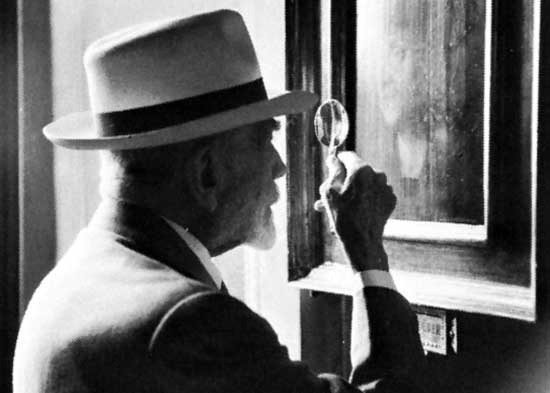 However in 1954 the Swede art critic Nils Gosta Sandblad began to look at Manet's work as highly modern and having been indicative of future art trends (beyond Impressionism). This idea has carried on until modern times and today Manet is considered by many to have been an artist genius. To learn more about Manet and his works please choose from the following recommended sources.